NEST Exam Centre 2019: National Institute of Science Education and Research (NISER) will be conducting the National Entrance Screening Test (NEST) and has announced the exam centre of NEST 2019 on January 3, 2019. The NEST 2019 exam centre will include the location of city/towns/states decided by the university. The candidates will be expected to reach the NEST exam centre 2019 if they wish to take NEST, an examination for admission to the five year integrated M.Sc. programmes. This year NEST 2019 will be conducted in 91 cities across the country. LATEST: NEST 2019 Admit Card is now available; click here to download! If the candidates wish to take NEST and get the details about their NEST exam centre 2019 then they will, first, have to register themselves on the university’s official site by registering their active email IDs and mobile numbers. Once they are registered, they can access their registered account by providing the details they filled earlier and can fill up the application forms for NEST where they will be asked to choose the location/s which is the most convenient to them. The chosen location/state/cities will, then, be declared as the candidate’s exam centre of NEST 2019. After filling up the form and submitting it, the aspirants can easily get the information regarding the NEST exam centre 2019 on their respective admit cards. The candidates should make sure that they carry multiple copies of their admit card. The candidates are also advised to carry the proof of their identity, birth and address. If the candidate fails to provide the important official documents while taking exam in the NEST 2019 Exam Centre, National Institute of Science Education and Research can declare that particular candidate as disqualified for the examination. Therefore, it is highly suggested that the students carry their documents with them while going to their allotted NEST 2019 exam centre. 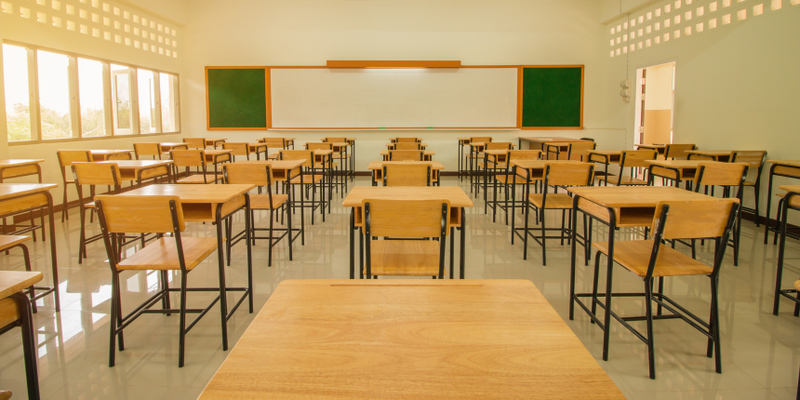 A proposed list of the exam centres of NEST 2019 has been announced by the university in its official website. 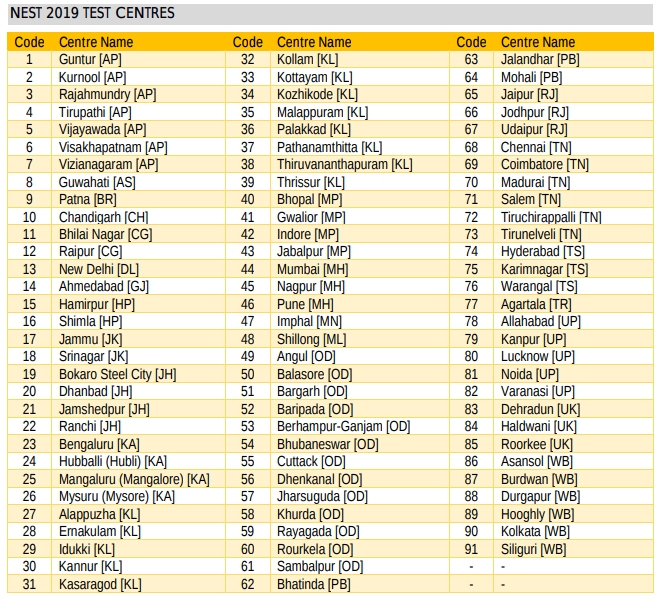 There were 106 NEST 2019 exam centres last year. The candidates have the liberty to choose upto five NEST exam centres 2019 whilst filling in their application form. The candidate can choose any five NEST exam centre 2019 from the list given above, depending on his/her convenience/priority, while filling the admission letter online. The committee has all the rights to cancel any exam centre of NEST 2019 without prior notice to the candidates. The address of NEST 2019 exam centre will be printed on the admit card of the candidates. The location of this exam centre of NEST 2019 should be considered as final, irrespective of the order of preference of NEST exam centre 2019 filled in the application form by the student. Once the NEST 2019 exam centre is selected in the application form, no changes will be done from the university’s end. The admit cards are available to download from April 24, 2019. The candidates will find all the information regarding NEST exam centre 2019 in the admit card itself. The students must make sure they carry their admit cards with themselves while coming for the entrance test. The candidates must not carry any electrical devices like smart watch, calculator, mobile phone etc. while entering the NEST 2019 exam centre. The aspirants must carry all of their official documents with themselves. Failure of which will result to their disqualification from the admission test. The students must make sure they reach the exam centre of NEST 2019 half an hour before to avoid any last minute delays and hassle free process. Question: Why should I choose more than one exam centres of JMI? Answer: The candidates are advised to choose more than one NEST 2019 exam centres because they will be allotted according to the candidate’s his or her first preference. Question: : Why should I choose more than one exam centres of NEST? Answer: The students must make sure they carry their admit cards with themselves while coming for the entrance test. The aspirants must carry all of their official documents like proofs of identity, birth and address with themselves. Failure of which will result to their disqualification from the admission. Question: How many exam cities are there for the examination in NEST 2019? Answer: There are seven JMI exam centres in total which include Calicut, Lucknow, Delhi, Patna, Guwahati, Srinagar, Kolkata.